ORLANDO, Fla. — After two days of walking the Orange County Convention Center floor at the Marine Dealer Conference & Expo, a consensus of opinion begins to emerge from this reporter’s sampling of the more than 1,000 conferees. • The educational track sessions are hugely popular, so much so that the convention center floor gets quiet each time a new session begins, leaving the approximately 100 exhibitors largely to talk among themselves. "The educational seminars here are dynamic," said Larry Russo, presidentandCEO of Russo Marine in Boston. "The presenters are all excellent and they&apos;re all well-attended." Numerous dealers and others ranked the educational sessions as one of the primary reasons they came. • MDCE has come a long way in a short time in becoming a must-attend event for dealers. Matt Gruhn, president of co-sponsor the Marine Retailers Association of America, documented the rise at Tuesday&apos;s luncheon with attendance figures from the past seven dealer conferences: 97 in 2007; 198 in 2008; 431 in 2009; 740 in 2010; 950 in 2011; 1,000 in 2012; and 1,100 this year. MDCE registered more than 600 dealers for the first time this year. "I&apos;m proud of 600, but I want 1,000 dealers here," Gruhn said. • Led by the educational track sessions, MDCE is improving as a resource of information and ideas. "This is such a great shot in the arm," said Fred Pace, managing partner at Legendary Marine in Destin, Fla. "The speakers seem to only get better and we get a great deal of content we can take back to our dealership." 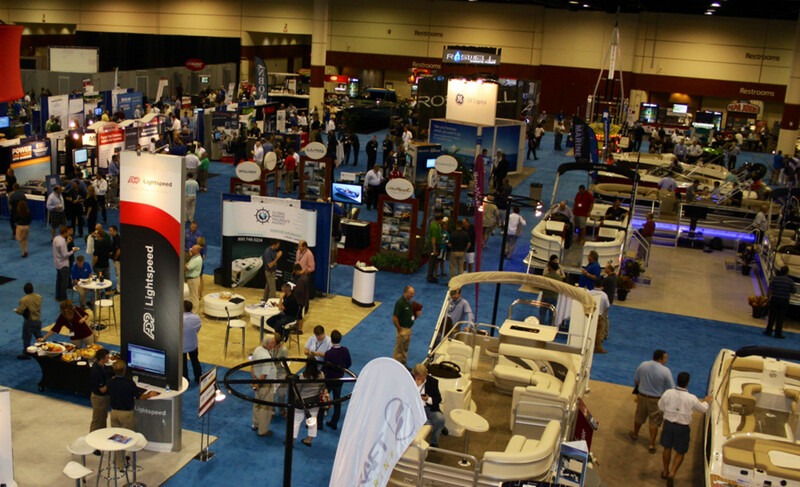 Brunswick Boat Group has more than 100 dealers at this year&apos;s MDCE, said president Andy Graves. "It&apos;s great to see them investing in the resource in an effort to make their dealerships better," he said. • More than ever, MDCE is a valuable networking resource. "It&apos;s the networking event if you&apos;re in any kind of marine retail," said Lynn Fiorenzano, president of Silver Spring Marine in Wakefield, R.I.
"I make a point of talking to people I don&apos;t know and sit at tables where I don&apos;t know anybody," said Joe Lewis, general manager of Mount Dora Boating Center in Florida. "This show gives you an opportunity to talk to your peers from across the country." Like others at the event, Lewis said that during his discussions he senses that "the mood is very upbeat. Everyone seems positive about the trajectory of the market."